​imported to the US from UK. 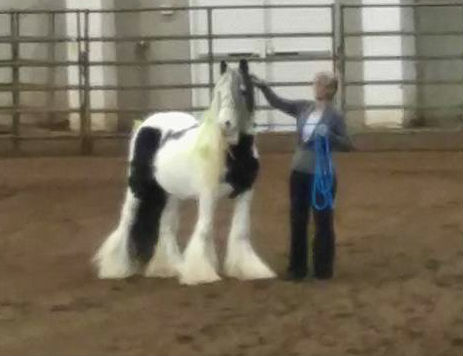 The Gambler nosed out several other Gypsy Equines to win the 2016 Year End Event Awards, by earning just a few more points for having one of his offspring "Gambler's Damien" also participating with him at the Northwest Horse Fair in Albany Oregon. The Year 2016 was the very first year for the IGEA Events Award Program. The Participants eligible this first year, happened to all be IGEA Founders who chose to share the message of the IGEA at Horse Fairs in the US. IGEA is first and foremost a Members Association, where all Gypsy Equines and their Owners are welcome. These Founders, modestly chose to just pass by, on receiving any awards, and wanted instead to roll over any prize or benefit into the future 2017 Events Award Program. Their hard work and dedication, on the road at Horse Fairs, behind the scenes in IGEA Committees donating their time to help create a friendly, safe, members environment, for all Gypsy Equines and their Owners. A Member's Association where everyone can have their preferences, ideas and voices heard for the greater good of the all. Since none of the Founders have sought any recognition, I believe this is an excellent time to thank them and provide them the mention of their accomplishments in spite of their modesty. Please show them some appreciation.﻿ Please see the other 2016 Events Award Participants by clicking the link below﻿. Thank you all, for making this a great, fun, and fast growing Organization.